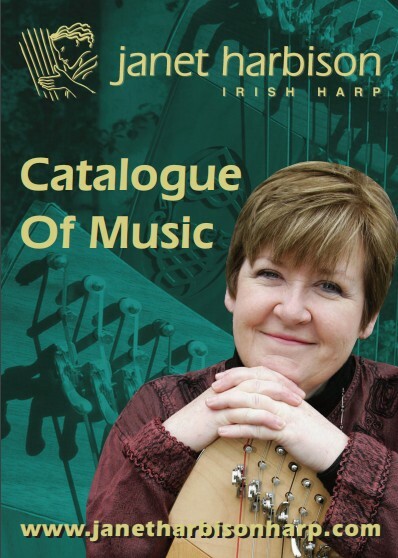 A good deal of Janet Harbison's work is published by Irish Harbison Harp Publishing and is available in hard copy or as a download on this website. buy in the shop. This contains over 100 items including CDs; Music books; Scores and Tutor books. Music may also be ordered by printing off the order form and emailing it to us. Not all music is yet published, but if you desire a score to something that is not listed, please email Janet so she may juggle her publishing priority list! Janet is also happy to offer to arrange something in particular for you - again, please make contact by email. Bookmark this page to keep up with new additions to the catalogue. Sign up for Janet's mailing list to receive e-mail updates on published music, newly uploaded works (for downloading), training options, harp courses and concert performances!